For young writ­ers who aspire to write infor­ma­tion books of their own, we’d like to help them under­stand how a writer works. When do you remem­ber becom­ing aware of Dr. Jane Goodall? I worked at Houghton Mif­flin when many of her books were being pub­lished and knew her edi­tor well. The first time I heard her give one of her bril­liant lec­tures, I became a total con­vert. What flipped the switch for you to con­sid­er writ­ing a biog­ra­phy of her? My edi­tor, Kate Olesin of Nation­al Geo­graph­ic, asked if the project would inter­est me. They had access to pho­tos and could put me in touch for inter­views with peo­ple who had worked close­ly with her. Since her 80th birth­day was approach­ing, I loved the idea of a biog­ra­phy that cov­ered her entire life. Why was it impor­tant for you to write about Dr. Goodall’s life for young read­ers? Her pas­sion, her ded­i­ca­tion to her cause, and her abil­i­ty to take a child­hood inter­est, a love of ani­mals, and turn it into her life’s work. I think chil­dren need hero­ines and heroes – and Jane Goodall qual­i­fies as one. How many books do you esti­mate you read to write about Dr. Goodall’s life? Prob­a­bly around 70 or so, and then I watched doc­u­men­taries, video clips, and read inter­views. You do so much more research for a non­fic­tion book than ever shows. But in the end, every­thing you exam­ine enters into what you write. Where did you look to find info about her child­hood, which you use so effec­tive­ly to estab­lish what moti­vat­ed her choice of her life’s work? For­tu­nate­ly a great deal has been writ­ten about her child­hood, both in sec­ondary sources and by Jane her­self. But to write that chap­ter I was often tak­ing a scene or idea from one book and com­bin­ing it with ideas and scenes from anoth­er. Writ­ing nar­ra­tive non­fic­tion is often like stitch­ing a quilt togeth­er, and scraps come from a vari­ety of sources. At what point did your ideas for writ­ing this book come togeth­er with a sin­gle, promi­nent thread that gave you a focus for Untamed? By the time I had final­ized the out­line, I knew the direc­tion the sto­ry would take. Sol­id non­fic­tion writ­ing depends on a good scaf­fold. If you don’t get that right, you have to redo and redo until the struc­ture is sound. When did you start writ­ing Untamed and how long did it take you before you sent the final copy edits back to your pub­lish­er? We had a sched­ule from the begin­ning of the project. I had a year for the first draft; we fin­ished edi­to­r­i­al revi­sion in 6 months. I have nev­er worked with an edi­tor as effi­cient and effec­tive as Kate. She knows how to keep a project on track! 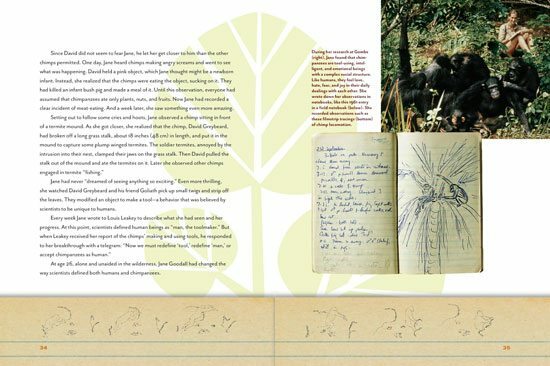 There are Field Notes at the end of the book that include facts about chim­panzees, biogra­phies of the Gombe chim­panzees, and a time­line of Dr. Goodall’s life, among oth­er things. Did these come out of your research? Did you begin by know­ing what you want­ed for back mat­ter or did that emerge after you gath­ered your infor­ma­tion? Some of these I knew I need­ed, like a time­line. But the edi­to­r­i­al staff at Nat Geo, who work on non­fic­tion all the time, had a lot of cre­ative ideas – such as fun facts about chimps or the fam­i­ly pho­to album. Also because of their exper­tise, the back mat­ter has been designed to be attrac­tive and read­able for chil­dren. What was your favorite part of cre­at­ing this book? See­ing the bound vol­ume. I knew Untamed was going to be beau­ti­ful – but the final book took my breath away. What makes you the most proud about Untamed? 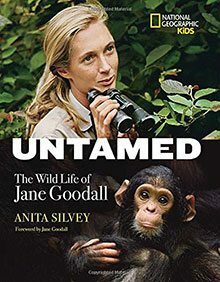 Jane Goodall her­self and the Jane Goodall Insti­tute read both the man­u­script and the final pages, check­ing for accu­ra­cy and inter­pre­ta­tion. 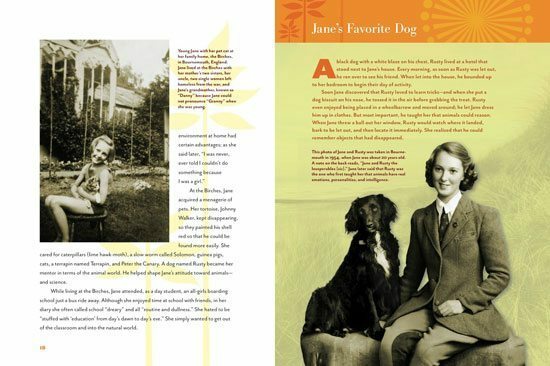 I am very proud that Jane Goodall con­sid­ered the book wor­thy of this atten­tion – and thought well enough of the book to write an intro­duc­tion. The author of eleven books, Ani­ta Sil­vey has devot­ed 40 years to pro­mot­ing books that will turn the young—and families—into read­ers. She has appeared fre­quent­ly on NPR, The Today Show, 60 Min­utes, and var­i­ous radio pro­grams to talk about our best books for young peo­ple. For­mer­ly pub­lish­er of children’s books for Houghton Mif­flin Com­pa­ny and edi­tor-in-chief of The Horn Book Mag­a­zine, she cur­rent­ly teach­es mod­ern book pub­lish­ing, children’s book pub­lish­ing, and children’s book author stud­ies at sev­er­al col­leges. For more infor­ma­tion please vis­it her web­site.